Sony NSZ-GS7 review | What Hi-Fi? It’s no secret that Google has done a rather good job of catching up with (some might say ‘surpassing’) Apple in the mobile phone market with its Android operating system. And now it’s looking to do the same thing in the media streamer market with this, the Google TV platform. 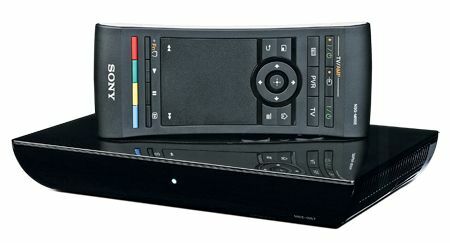 It’s seen for the first time here, built into a Sony-built device, the Sony NSZ-GS7. The interface is a very simple, desktop-like one, with a wallpaper that can be user-selected and a row of icons along the bottom to give quick access to apps and the user guide. If you’re not a fan of the apps on this home screen, simply swap them for those you’d prefer from the ‘All Apps’ page. You can add widgets to the home screen, too. It has to be said that there are only two available right now – a clock and a Twitter feed – but we expect many more to follow in a short while. Apps are, of course, a big part of Google TV, and there are a couple that come pre-installed that are well worth a mention. First is Netflix, which might badly lack quality in the movies stakes but does have a fairly robust catalogue of TV shows available to stream, as well as excellent video quality and a great interface. Much better is Sony Entertainment Network (SEN), which includes both a Spotify-style music subscription service and a pay-as-you-go movies-on-demand portal. The former lacks the catalogue and audio quality of its best rivals, but thanks to a very good, up-to-date library, 1080p quality and great surround sound the video store is perhaps the best on the market after iTunes. If your (not unreasonable) expectation is that the NSZ-GS7 will have all the functionality of Sony’s other media streaming devices as well as a Google skin, you could end up a bit disappointed. As of right now there’s no iPlayer app, for example. LoveFilm and Spotify are missing, too, as is Facebook. These are exactly the apps that we’d expect to join the Google TV bandwagon sooner rather than later, but we’re not in the habit of counting chickens before they’ve hatched, so it needs to be raised as a weakness. There is, though, a workaround, and that is Google Chrome. Unlike all of the dodgy custom browsers you get on other media streamers, Google Chrome is a fully functioning web browser that’s been optimized for use on a television. In combination with the GS7’s remote control (above) it provides the best internet-on-TV experience we’ve had, and because it has full support for embedded video you can simply navigate to the iPlayer or Lovefilm websites to access their delicious content. It’s not as neat as using a dedicated app, but it works. So that’s internet content taken care of, but what about streaming your own media? Well, incredible though it is to believe, the Sony doesn’t handle this natively at all. Instead you need to download the Plex app from the Google Play store as well as install the Plex Media Manager on your computer or a NAS (if you’re lucky enough to own one that’s supported). True, Plex is a fine piece of software, it costs just 65p, and if you’ve got some nice HD video files they’ll look lovely when played through it, but we can’t help but feel that it shouldn’t be necessary, and the fact that it doesn’t support music leaves a real gap in the Sony’s repertoire. We’re sure that more apps that handle DLNA will appear, but as with other areas of the performance we’re not going to absolutely bank on it, which is why for now the GS7 has to make do with four stars. If the Google TV store develops as we hope and expect, we’ll be more than happy to add a fifth at a later date.